New cover art for the Lord John books! A meme for OUTLANDER fans! "We are honored by your offer of friendship and goodwill," said Colum clearly. "We accept your obedience and hold you in good faith as an ally of the clan MacKenzie." There was a lessening of the tension over the hall, and almost an audible sigh of relief in the gallery as Colum drank from the quaich and offered it to Jamie. The young man accepted it with a smile. Instead of the customary ceremonial sip, however, he carefully raised the nearly full vessel, tilted it and drank. And kept on drinking. There was a gasp of mingled respect and amusement from the spectators, as the powerful throat muscles kept moving. Surely he'd have to breathe soon, I thought, but no. He drained the heavy cup to the last drop, lowered it with an explosive gasp for air, and handed it back to Colum. "The honor is mine," he said, a little hoarsely, "to be allied with a clan whose taste in whisky is so fine." I like this image because it fits very well with my experience while re-reading ABOSAA. That book always leaves me emotionally drained, exhausted, by the end. I think the idea that the readers, as well as the characters in the story, have been tossed onto the shore at the very end of the book by some gigantic wave is not hard to imagine at all. <g> I always need a bit of time to recover after I finish a re-read (or "re-listen") of ABOSAA, and this picture helps to explain why. 3) The picture above shows a 1960 Morris Minor, similar to Roger's car. (Although I imagine Roger's car as looking much more beat-up.) Click on the picture to see a bigger view. Brianna drove the little car slowly up the slope of the quilt over Roger's leg, across his stomach, and into the center of his chest, where he captured both the car and her hand, giving her a wry grin. "That's a really good car," she said, pulling her hand loose and rolling comfortably onto her side beside him. "All four wheels turn. What kind is it? A Morris Minor, like that little orange thing you had in Scotland? That was the cutest thing I ever saw, but I never understood how you managed to squeeze into it." "With talcum powder," he assured her. He lifted the toy and set a front wheel spinning with a flick of his thumb. And it is indeed hard to imagine how a 6'3" man would fold himself into the driver's seat of a car that tiny. 4) Those of you who have read AN ECHO IN THE BONE will remember William's adventure in the swamp (chapter 36, "The Great Dismal"). Here's a video that I found a couple of years ago on the website of the Raleigh News and Observer, my local newspaper. 5) A white piglet. I like to think that this may have been what the White Sow looked like, when Jamie and Claire first acquired her. At this stage it looks pretty cute and harmless, but appearances can be deceiving! At the moment, our total stock consisted of a small white piglet, which Jamie had obtained from a Moravian settlement thirty miles away, exchanging for it a bag of sweet yams I had gathered and a bundle of willow-twig brooms I had made. Rather too small for the penfold, it had so far been living in the shed with us, where it had become fast friends with Rollo. I wasn't quite so fond of it myself. Considering how much trouble that White Sow was going to cause in the next few years, I'm not sure whether they got a bargain or not. <g> I hope you enjoyed these Friday Fun Facts! Look here to see all of my Friday Fun Facts blog posts. And please stop by next week for more! @Nenya - well, I'm not an expert on pigs, by any means! I grew up in the suburbs. :-) I picked this one because it fits my mental image very closely, that's all. I had read in interviews that each of Diana's book as a "shape", and this week's fun facts really fleshed that idea out. Bravo! Love piggies...so cute when they are babies. BUT what isn't? (Bet even old Murtaugh was a cute baby....well, maybe not!) Mean as snakes, sometimes, when they grow up though, especially when they have a litter around. Great as usual Karen! 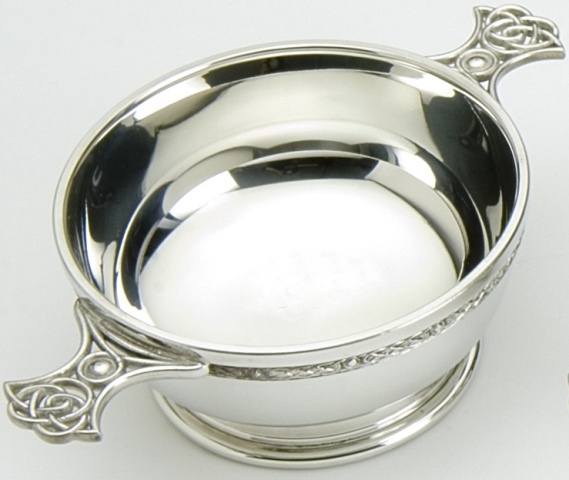 What a beautiful quaich. I think I saw one at and antique show once, although I didn't know what it was. (bf Outlander) If I knew I would have bought it! Karen, you put your whole heart into "All Things Outlander" and it shows. I really enjoy your Friday posts and I always enjoy your thoughtful and insightful posts on Compuserve. Keep it coming! And Thank You! Awesome. I loved that you included a video like the Great Dismal. Loved the sounds of the birds and nature but I could totally picture William getting all the mosquito bites on his eye lids. I wanted to swat my arm just listening to swamp. I look forward to these Friday posts. I dont always comment but I do come and read them. Thanks, Michelle! Good point about the mosquitoes, too. Wonderful fascinating facts again Karen - thank you for adding another layer of appreciation to the books. 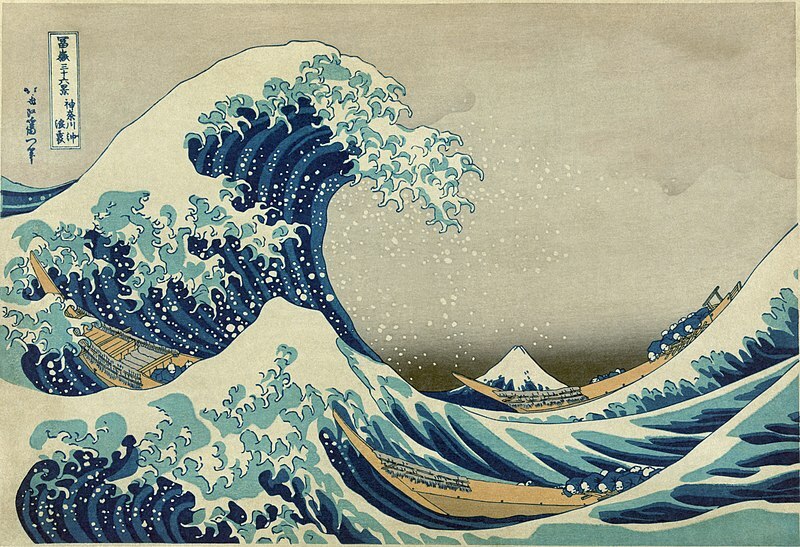 Re: The Shape of the Books - I have seen that woodcut by Hokusai before, but after the awful Japanese tsunami last year that killed about 20,000 people I can no longer look upon it without a great feeling of terror in my heart. Re: Roger's Morris Minor - my Grandma had a Morris Minor and it is now sitting in my Dad's barn waiting to be restored. Roger must have been joking about needing talcum powder to squeeze into it because they are actually quite roomy inside. Not like Minis. @Anon - thanks, I'm glad you enjoyed this week's FFF!